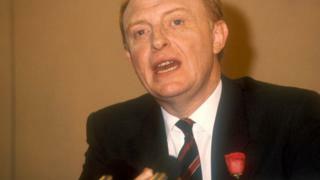 Image caption 'He was a great speaker, Kinnock' - the then Labour leader speaking at the 1987 party conference. Anyone who has just stepped off the party conference circus may have their faith restored by a browse of Philip Collins's new book. Collins, a former speechwriter to Tony Blair, has written a timely volume sub-titled 'speeches that shape the world - and why we need them'. His book recalls speeches that could move an audience, change a debate or win an argument and that have stood the test of time. I can't claim to have heard many in that league during my autumn tour of Bournemouth, Brighton and Manchester this year, although Theresa May's speech was memorable in different ways. Collins has also been sharing his thoughts with Duncan Smith of Radio 4's The Westminster Hour, which featured an extract from a Neil Kinnock speech to the Wales Labour Party conference in 1987. You probably know it as the 'thousand generations' speech and Lord Kinnock has spoken to his biographer about its construction here. In the speech, in Llandudno, the then Labour leader asked: "Why am I the first Kinnock in a thousand generations to be able to get to university? Why is Glenys the first woman in her family in a thousand generations to be able to get to university?" His answer was that he and his wife had opportunities denied to their talented ancestors. "Two things you notice about that," said Collins, listening to a recording. "One is the voice, what a beautiful speaking voice he had in the tradition of Aneurin Bevan, another great Labour orator. The other thing is what a good case he makes in other speeches and in fact in that speech Kinnock makes the case for state action to help people in the abstract but what he does there is he dramatises it. "There are real people and he's not feeling sorry for them. They're not victims of having no platform. On the contrary they're incredibly strong people. The whole passage is about how talented, strong etc they are and that makes it all the more potent. He's telling a story which is a great thing to do in rhetoric and he is posing the case in a really vivid way and it's incredibly effective." Collins, now a Times columnist, also praised Kinnock's 1985 Bournemouth speech - the "grotesque chaos" anti-Militant one - as "wonderful, really memorable stuff". He added: "He was a great speaker, Kinnock. In my lifetime of watching British politicians, I think he's the best speaker." But the former Bedwellty and Islwyn MP never became prime minister. "It therefore also serves as an example of the limitation of rhetoric. You can't talk yourself out of a perception. "It was the public, not enough of them thought he was prime ministerial, they didn't think winning the battle within the Labour Party was enough. And no matter how good Kinnock was on a platform it didn't in the end make him appear to be a viable prime minister. "So rhetoric can go so far but it can't transport you if the rest of the political package isn't thought to be there." *'When They Go Low, We Go High' by Philip Collins is published by 4th Estate.